Architecture, design, textiles, objects covered in resin and much more. It’s easy to get lost in the myriad of events New York has to offer this week. 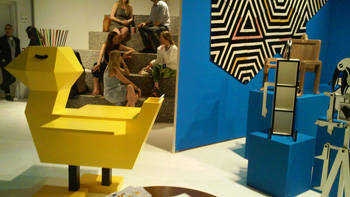 Like every year, it’s design week: the city is painted with novelty, it becomes even more alive. 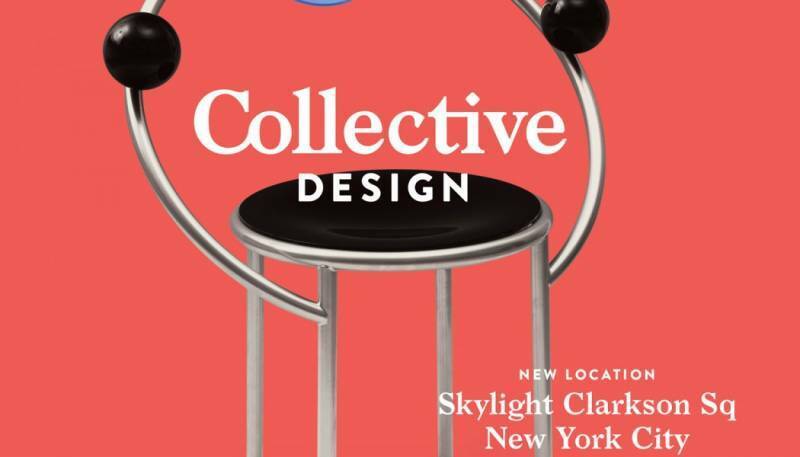 From SoHo to the West Village, to Roosevelt Island, you have the chance to enjoy events and panels on the significance of design in the 21st century, on the role of women in design, on the new digital era. 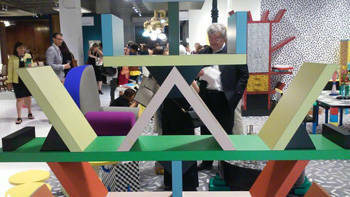 The best showrooms in the sector, like Cappellini, Kartell, Alessi, and Poltrona Frau, are there to invite professionals and visitors to cocktail parties and new collections. Young brands dip their toes into the market. Throughout these hectic days we were seduced by the Skylight Clarkson in the West Village. The line to get in is endless, bizarre golden beehives border the street and lead to the entrance. The lineup of Design Week extends across all continents touching upon the design capitols: in addition to Milan, we have Madrid, Copenhagen, Paris, Stockholm, Mexico City. This year, the Collective Design Fair focused on special exhibits and groups of young designers, such as the solo show by influential German lighting designer Ingo Maurer, the Sight Unseen and American Design Club – which focuses on emerging artists - , the installations of Isamu Noguchi (1904-1988), one of the 20th century’s most important and critically acclaimed sculptors. Among these exhibits, “Collective focus: Italy”, curated by Stefano Tonchi, editor-in-chief of W Magazine, explores the excellence of our existing and emerging design. Walking around, trying out unusually shaped chairs, stroking smooth, cold surfaces, touch and sight are pleasantly by the quantity of objects to observe. Amongst the international artists we find the renown Olek. 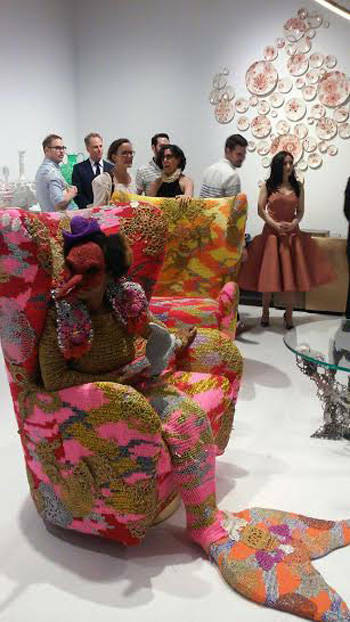 The Polish artist, know throughout the world for her crochet works, takes up an important role within urban art. 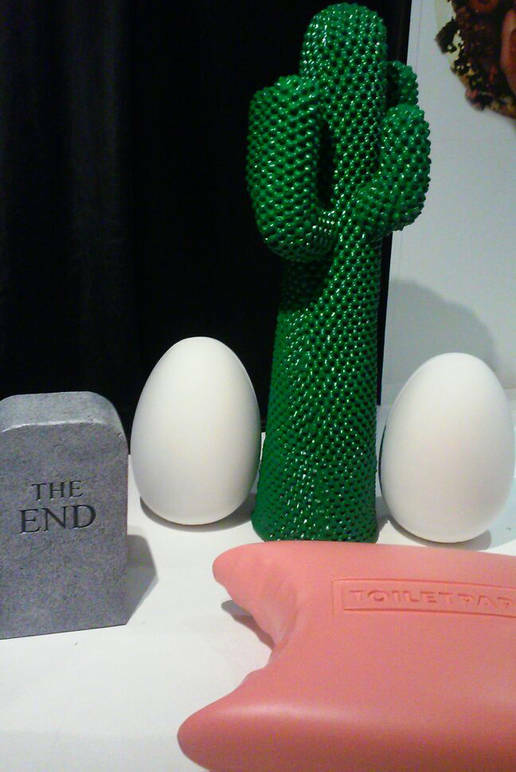 Also present are the playful and disturbing works by the irreverent Maurizio Cattelan signed Toilet Paper, the historical Memphis Post Design Gallery with over 30 years of experience founded by Ettore Sottsass, pillar of the group. The colors and style of the gallery are reminiscent of the multicolor look of the 80’s. Amongst the young we find “Palafitte”, the new project by Giacomo Moor, presented for the first time by Project B Gallery. The Milanese artist explains that he wants to engage, through his work, in the relationship between space, design and environment. His furniture is in fact inspired by the verticality of stilts and has eastern influences, the sandpaper glass clouds transparency. All this is done with a brand new thing, laminated bamboo “it guarantees high resistance and elasticity”. Between a glorious past with Venini’s Murano glass, and a contemporary present with new and innovative ideas, the curator of this exhibit centered around “made in Italy”, Stefano Tonchi himself states “in Italy design is a dialogue between past and present that simply never stops”.